In the early 1800s local Baptists established the Christian Baptist Church here at the top of Adamsville Hill; after the church closed, the building was later used as a school. Today, the buried foundation is all that remains of the building that once stood on this site. The Christian Baptist Church's minister may have been Francisco Veray. He was the first recorded person from Portugal to live in Little Compton, anglicizing his name to "Francis Veray." He, along with his wife, daughter and grandchildren, is buried in the center plot of the cemetery adjacent to the church. Shortly after Veray's death in 1866, it appears the church closed. The building quickly reopened as the Number Six School. Originally, the school was farther down Adamsville Hill, most likely in the small blue house that still stands on the hill's slopes today. The school had one teacher who taught grades 1-8, and it operated until 1929, when the Wilbur School opened on the Little Compton Commons. Once it stopped functioning as a school the building housed the Bell Whist Club for a short time. It was eventually auctioned in 1930; the new owners moved it across the border into Darmouth, MA, to serve as an office for a propane business. 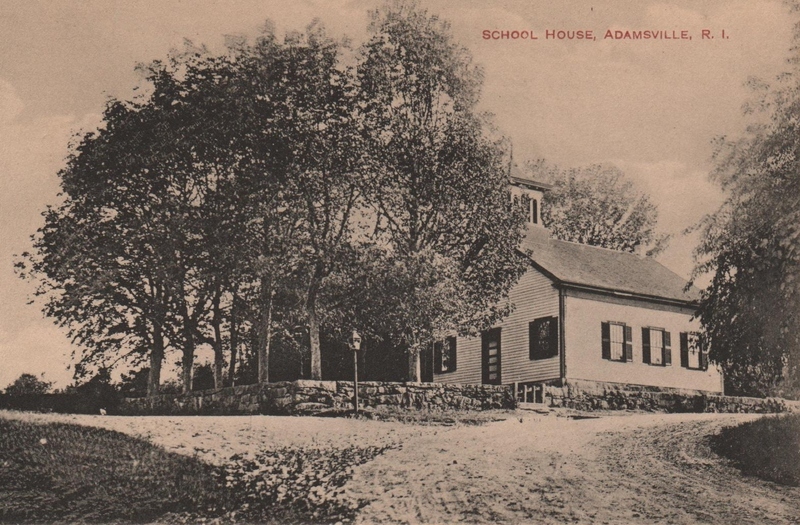 Number Six Schoolhouse : The Number Six School served as the primary school in Adamsville from the early nineteenth century until the new Wilbur School opened on the Little Compton Commons in 1929. This building, formerly the Christian Baptist Church, was the second schoolhouse on Adamsville Hill. 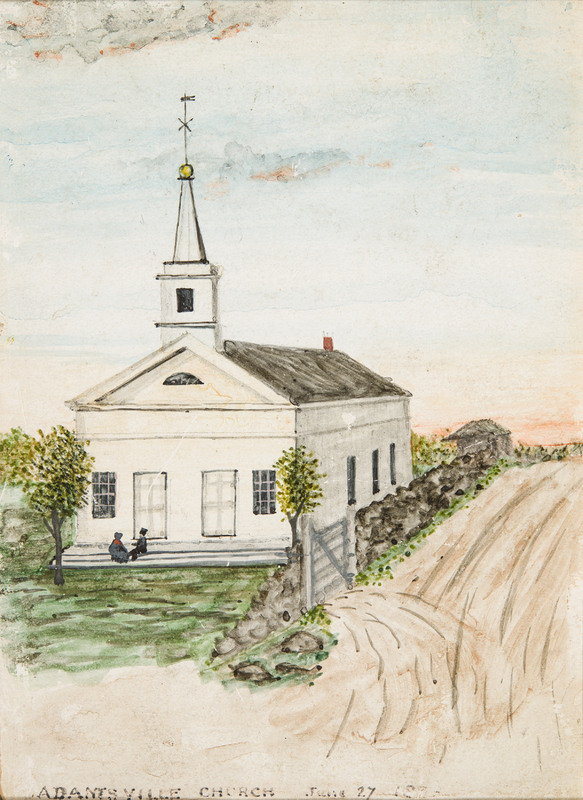 Christian Baptist Church : This painting by Joseph Shoemaker depicts the Christian Baptist Church. Initially built to serve for religious purposes, the building was later repurposed as the Number Six Schoolhouse after the Christian Baptist Church's congregation proved relatively short-lived. 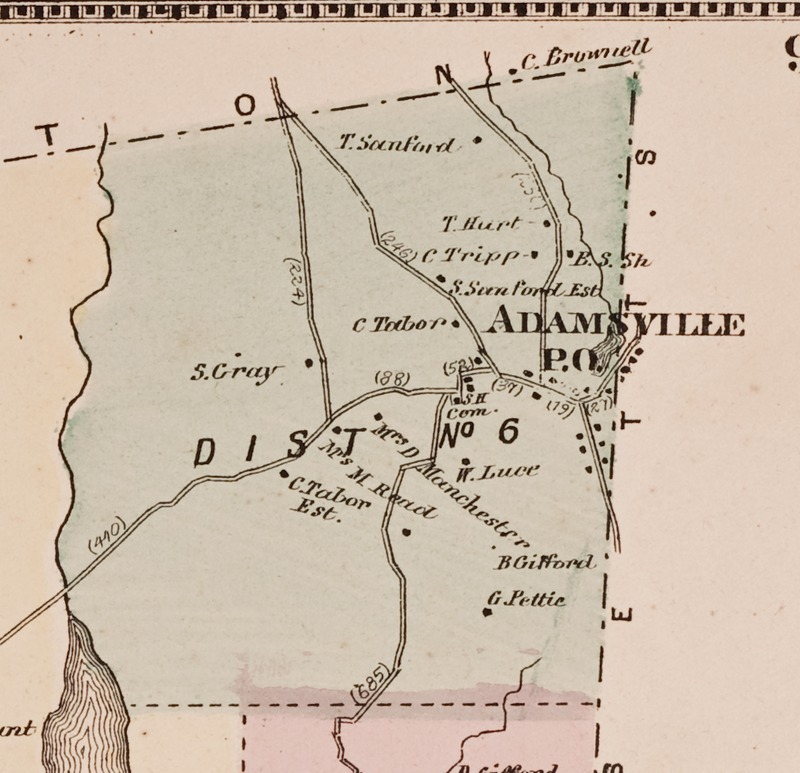 1870 Map : This 1870 map of Adamsville showing the boundaries of Rhode Island school districts. As school district No. 6, Adamsville was initially served by the one-room "Number Six School" on Adamsville Hill. 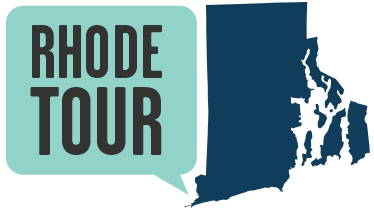 Marjory O'Toole, “Number Six School and Adamsville Church,” Rhode Tour, accessed April 22, 2019, http://rhodetour.org/items/show/118.